Steven Seagal is Under Seige. Many MMA fans reject the idea that he is seriously training Lyoto Machida and Anderson Silva and improving their games. They feel that Seagal is "trolling" the MMA world along with the help of the two superstars and doesn't really have anything to offer. 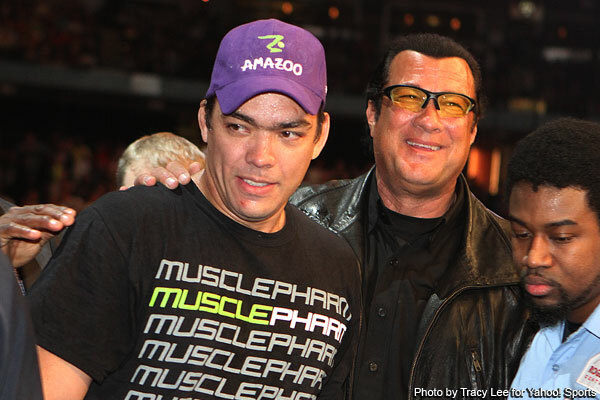 However, both Lyoto and Anderson seem to pay close attention when Seagal speaks and they've made the Executive Decision to keep him around during the training camps. Plus they both finished their last opponents with a kick that they Seagal credit for refining for them. For his part, Seagal certainly seems to take this stuff very seriously. In the following video he works with Lyoto Machida, making the elusive Brazilian karate man even more Hard to Kill. Check it out.